Today, the Massachusetts State Quarter Coin remembers when a group of men began the Society for the Suppression of Intemperance on February 5, 1813. The excessive use of ardent spirits, in our country, cannot fail to be deeply deplored by every friend to the true interests of mankind. It may be assumed, upon a very moderate estimate, that more money is expended for ardent spirits, unnecessarily and even injuriously consumed, than is expended for the support both of the ministry and of schools. By this lamentable excess, many individuals are ruined, many families are made wretched, the public morals are corrupted, and society is deeply injured. An evil so extensively destructive calls loudly for a remedy. It is well known, indeed, that vices, when prevalent and inveterate, are not easily suppressed; yet experience testifies, that, by suitable endeavors, they may be counteracted and checked. Particularly it has been proved by successful experiment, that, with the blessing of God, much to this effect may be done by associations formed for this benevolent and important purpose. From such an association in this Commonwealth, calculated to act upon an extensive scale, great and lasting utility may reasonably be expected. ART. I.—The name of this Association shall be The Massachusetts Society for the Suppression of Intemperance. ART. II.—The object of the Society shall be to discountenance and suppress the too free use of ardent spirits, and its kindred vices, profaneness and gaming; and to encourage and promote temperance and general morality. With a view to this object, the Society will recommend the institution of auxiliary societies, in the different parts of the Commonwealth, upon such a plan as shall be deemed the best adapted to give system and efficiency to the whole. It will also hold correspondence, as occasion may offer, with other societies which may be instituted for the same general object. ART. III.—No person shall be eligible as a member, who is not of a fair moral reputation; nor shall anyone be admitted as a member, unless nominated in open meeting, and approved by the votes of two-thirds of the members present at the time. Any person thus nominated and approved may become a member, by subscribing this Constitution, or announcing his acceptance of his election, and paying two dollars for the use of the Society, as in the case of original members. ART. IV. — The Society shall meet annually at Boston, on Friday next after the general election, at nine o’clock, A.M., and at other times as duly notified. The meetings of the Society, annual and special, shall be publicly notified, in two at least of the Boston newspapers, during two weeks immediately preceding the day on which they are to be held. At each annual meeting, a sermon or address shall be delivered before the Society by some person elected for the purpose. The number of members shall not be less than thirty to constitute a quorum for the election of officers and members, and not less than twenty-one for other business. ART. V.—The officers of the Society shall be a President, three Vice-Presidents, a Corresponding Secretary, a Recording Secretary, a Treasurer, and eight Councilors, to be chosen at each annual meeting, and to continue in office until others are elected. These officers shall constitute a Board of Council. ART. VI.—It shall be the duty of the President to appoint the place of holding the annual meeting of the Society, and also to call special meetings on the request of a majority of the officers of the Society, or any ten members thereof; and, if the President be absent from Boston, any of the Vice-Presidents shall have authority to appoint any meeting as aforesaid, and to direct the Secretary to notify the same. The Corresponding Secretary shall hold such correspondences as the purposes of the Society may require, subject to the direction of the Board of Council. The Recording Secretary shall duly notify all the meetings, and keep a fair record of the doings of the Society and of the Board of Council. The Treasurer shall keep the moneys and the accounts of the Society, subject to the direction and superintendence of the Board of Council. ART. VII.—It shall be the duty of the Board of Council to act as the Executive of the Society; to make communications to the auxiliary societies; to receive communications from them; to collect, combine, and digest facts and general information relating to the purposes of the Society; to devise ways and means for the furtherance of these purposes; to apply the funds agreeably to the Society’s directions; and, at each annual meeting, to report to the Society their doings, and a digest of the facts and general information which they may have collected, and such measures as they may judge suitable for the Society to adopt and pursue. They shall hold stated quarterly meetings. ART. VIII. —Each member of this Society shall make it an object to discountenance and prevent, as far as may be, by his own example and influence, every kind of vice and immorality. ART. IX.—All clergymen in this Commonwealth are considered as members, on their giving notice of their desire of becoming such, or subscribing the Constitution; and they are exempted from the payment of two dollars, as above provided respecting other members. ART. X. —The Constitution shall not be altered, except at an annual meeting, and by two-thirds of the members present. After adopting the above Constitution, the Society adjourned to nine o’clock next morning, to organize by the choice of officers. 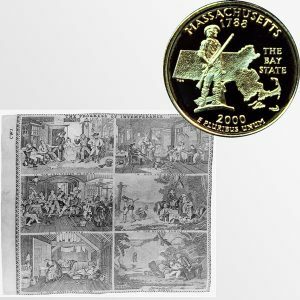 The Massachusetts State Quarter Coin shows with an artist’s portrayal of the progress of intemperance, circa 1840.